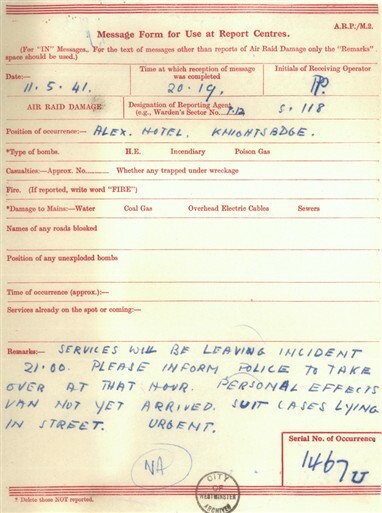 At around 12.30am, 11 May 1941, the Alexandra Hotel in Knightsbridge SW1 was struck by a single high explosive bomb. 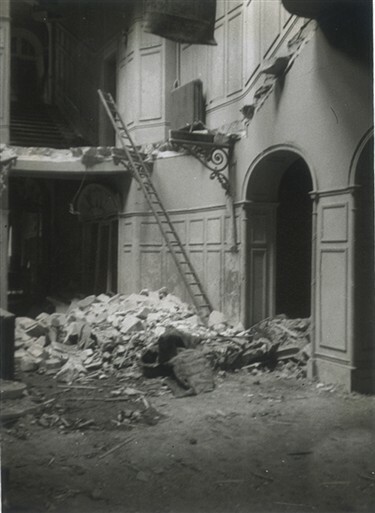 The bomb smashed straight through five floors of the opulent 1864 hotel, detonating in the heart of the building and completely demolishing its central stairwell, ornate spiral staircase and lift shaft. 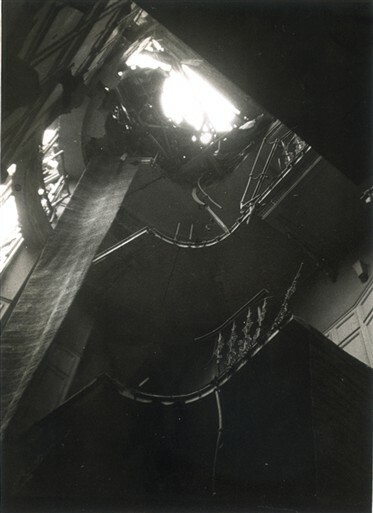 The blast left a heavy pile of debris on the foyer level, right in the centre of the building. The Hotel was fully occupied at the time of the raid: many of the guests were trapped in the basement and on the upper floors. As the first ambulances arrived at the scene, the foyer floor collapsed onto those trapped in the basement below. Rescue workers were forced to cut through several thick walls to reach them. On the upper floors, teams also cut through a series of bedroom walls to reach trapped guests. 24 fatalities were reported with 16 seriously injured. City of Westminster records show that personal effects and suitcases were later collected – some from the street - and returned to survivors and relatives. 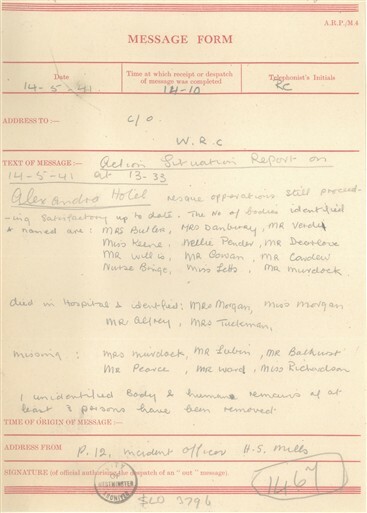 With the Alexandra’s registration book missing in the debris, rescue workers faced the additional problem of identifying victims and determining the total number of guests and staff involved. The investigation remained open until 19 May. By then, the local police had accounted for all but one individual. 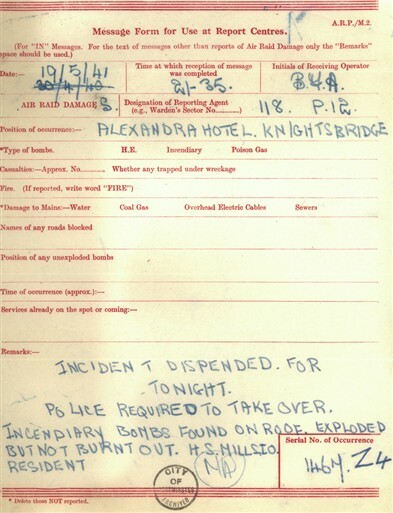 The same day ARP messages also reported the discovery of spent incendiaries lodged on the Alexandra's roof. 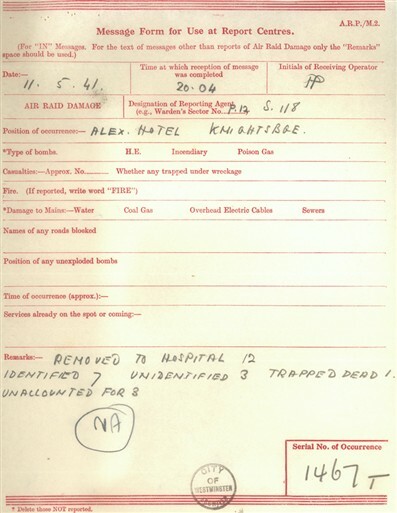 The Alexandra Hotel bombsite was rebuilt as Agriculture House, Knightsbridge from 1954-1993. In turn, the site was redeveloped in 1993-1995 as Nos 25 and 27 Knightsbridge. This page was added by Ronan Thomas on 03/08/2010. John lubin, one of the missing persons was my uncle, he was only 18 when he died on the roof of the alexandra hotel fire watching for enemy aircraft. His family hoped to find out where the final resting place was for his remains, but this still unknown. The "Miss Keane" marked on the third Message Form was my great aunt, Margaret Keane. She was from Clonea, Carrick-on-Suir, Waterford, Ireland. I never had the chance to meet her, nor did my father, as my grandmother emigrated here to the States in 1923. Thank you for keeping her memory alive with this website, together with all those who were lost to the Blitz. My great grandfather Mr Willis was killed in the same incident. I have a photograph of three staff outside the hotel how can I get this posted to this site? 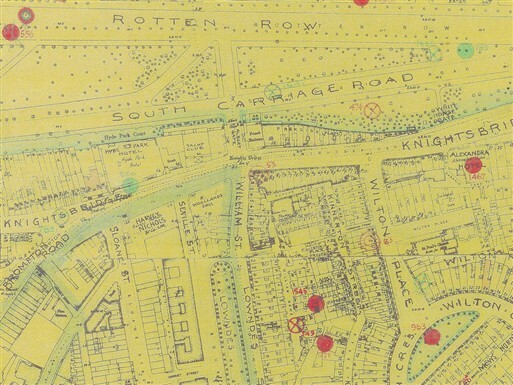 If you would like to post or bring in the photograph to the City of Westminster Archives Centre we would be happy to scan it, post it online and then return the original to you.